Exactly what you need to keep your feet cool and fresh this summer, this men’s triple pack of low ankle Glenmuir Bamboo Trainer Socks promotes healthy skin and puts the emphasis on total comfort. 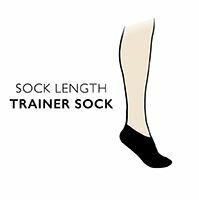 Manufactured to a high standard, including hand linked toes for smooth seams, this light gauge socks are fine and silky-soft to the touch. The popularity of bamboo-based fabric keeps growing (not unlike the sustainable, ethically-sourced plants themselves) because of its gentle, skin-friendly properties. Bamboo is naturally hypoallergenic, antibacterial and able to maintain the optimum skin temperature at all times. It absorbs more moisture than cotton and can wick it away swiftly, so feet stay dry and odour-free for longer.